I love stories that take place before something apocalyptic happens: characters that know what is going to happen, but are helpless to stop it. They have their last meals, spend their last nights with their loved ones, and then accept the inevitable. Which is why I am super excited for the "Last Days" of the Marvel universe. "Last Days" is one of the banners of Secret Wars; the other two, "Battleworld" and "Warzones," both take place during the Secret Wars. "Last Days" takes place before when all the characters know about the impending incursion and know there is nothing they can do to stop it. So what then? What do they do when there is nothing they can do? So far, all of the stories announced have looked incredibly interesting and pretty ready to hit me in the feels (as they say), although there have also been some surprises that I didn't expect. 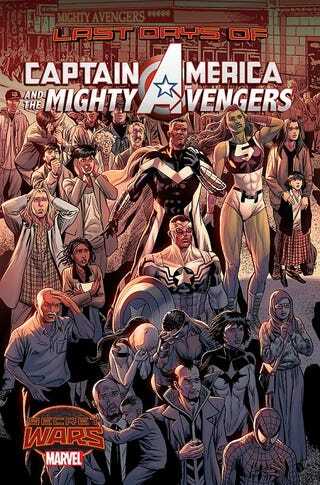 First up is the Last Days of Captain America and the Mighty Avengers (Captain America and the Mighty Avengers #8-9). Writer Al Ewing has said that everyone will get a moment: "Some members will want to be with their loved ones and families — even if they have no families left. Some members will want to fight to the end to try to preserve the Earth, any way they can, even though the situation may be hopeless. And some of what we see will just be small acts of decency performed in the last hours of existence." Gunn: What if I told you it doesn't help? What would you do if you found out that none of it matters? That it's all controlled by forces more powerful and uncaring than we can conceive and they will never let it get better down here? What would you do? Anne Steele: I'd get this truck packed before the new stuff gets here. Wanna give me a hand? Then there's the Last Days of Magneto (Magneto #18-21), where writer Cullen Bunn says, "Magneto sees the world ending. That would mean that everything he's worked for... all the terrible things he's done... would be for nothing. He has fought to save mutants, and now everything is going to be wiped out. Magneto simply cannot allow that to happen. He sets out to save the world, and he'll stop at nothing to do so." Of course, he's going to fail. And then there's the Last Days of Loki (Loki, Agent of Asgard #14-17): "The apocalyptic war is what happens when the Ten Realms realize, with their God-sight and magic powers, that the universe is coming to an end. This isn't like previous incursions, which went by without comment — this has a unique symbolic weight, because it really is the end, and creatures of story like the Gods can feel that primal ending resonating in their blood and bone. So suddenly, everyone wants to settle scores. And at least one incarnation of Loki is only too happy to help." The Last Days of Ms. Marvel, starting with Ms. Marvel #16. This looks like it's going to be the saddest, most depressing one. Per G. Willow Wilson: "When the world is coming to an end, do you accept that it's over…or do you keep fighting for those you love? When losing is inevitable, how do you define yourself? In the Last Days story arc, Kamala has to grapple with the end of everything she knows, and discover what it means to be a hero when your whole world is on the line." On the plus side, it looks like she may finally meet her hero, Captain Marvel. At the end of all things, Black Widow finds herself unexpectedly connected to one of the darkest moments of her past. See how the first lines of red in her ledger were written. Will Natasha fall into darkness or rage against the dying of the light? One of the Punisher's allies falls. Someone's picked the wrong fight. The Punisher steps back into a War Zone. "It'll all be gone. Kaput. Blammo! KABOOOOOM! Secret Wars is going to wipe out the entirety of the Marvel Cosmos. And it's going to do that while the Surfer is, y'know, in it! "And that's where the bizarro, head-trippy, fun of what Mike Allred and I are doing during Secret Wars starts! The beginning of our story is: and then everything that ever was or will be...blew up! What a great launching point!" Which one looks good to you? Or would you prefer reading "Battleworld" or "Warzones" books?